When discussing “best digital pianos” in the context of beginning pianists, we talk affordability as much as we talk quality. The average beginner may not be able to afford the thousands of dollars needed to get a pro level instrument. And that’s why our today’s reviews are on the best digital pianos for under $500. Are you a budding musician looking for a quality digital piano that doesn’t cost an arm and a leg? Then you’re just the person we want to talk. Our entire research and article today are specially dedicated to you. Check it out, we’re not just going to display our top ten absolute best digital pianos for under $500. Because we know how easy it is to buy wrong in this section of the piano market, we’re throwing a buying guide too. We’re going to make sure that whatever you spend is going to be worth it. To get all the deets, keep reading! Probably the poster kid for entry-level digital pianos, the Yamaha P45 is a piano that needs no introduction. And coming from legendary market giant and world famous Japanese brand, Yamaha, it’s no surprise. 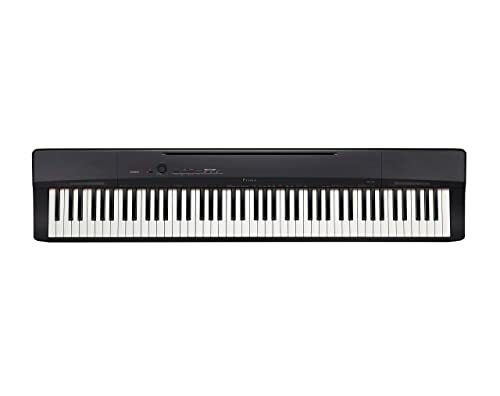 The Yamaha P45 is a sturdy piano in Yamaha’s P series. It is portable, hence the reason it is in the P series. So, it makes a fantastic choice for beginners who would have to make a lot of trips from practice to home and so on. It’s also a fantastic choice for people who are tight on space. It’s really compact so even though it does not come with a stand, you can place this on a table and it will work just fine too. The keyboard might not be to die for, at least not for the advanced pianist, but it suffices for a beginner. While it doesn’t come with simulated ivory/ebony which feels like heaven, it is finished in matte. So, it gives a good grip which you’ll especially come to appreciate when your fingers start to get moist in the middle a long practice. The sound engine used here is Yamaha’s AWM Sampling technology. It’s not Yamaha’s best technology, expectedly. But it is great nonetheless and high quality. We like how Yamaha keeps the number of voices here to a bare minimum. In our opinion, a beginner does not need to be overwhelmed with too many functions just yet. So, the ten built-in voices should satisfy most beginners at least till their skills grow. In all, we love the P45. 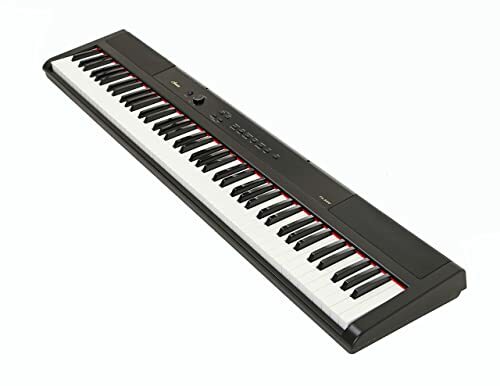 It is a no-nonsense keyboard with fully-weighted keys, an acoustic feel and an authentic piano sound. Comes with 88 keys all fully weighted. The included sustain pedal feels low quality. The Yamaha P71 and P45 are cut exactly from the same block. They are very similar and share the same exact qualities which make them great for beginners. Since its release into the market in 2016, this keyboard has become a bestseller. 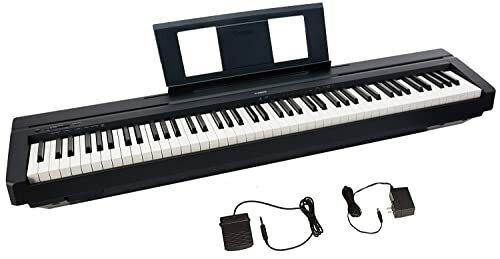 Beginners love it and musicians looking for an instrument they can travel with have also taken a fancy to this keyboard. The P71 is compact and lightweight. And at its already competitive price point, you get a sustain pedal as well as a power adapter in the package. As you can see, this is a pretty good deal, especially since the keyboard also comes with excellent features to wow the user. However though if you intend to travel with this a lot, then we’d advise that you get a padded gig bag. Since the body is made entirely of plastic, it could easily get cracked as you move around. Now just like on the P45, the keyboard on the P71 is great. 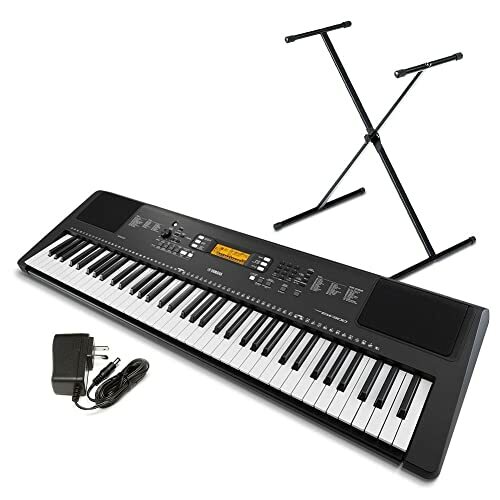 It comes with 88 fully weighted keys backed by Yamaha’s Graded Hammer Standard (GHS) action. So, just like an authentic classical piano, this feels heavier on the low notes than it feels on the higher notes. Plus the keys are also velocity sensitive, so they give a nice response as you play. The sound is great, the same AWM Stereo Sampling technology you saw on the P45. Plus, the instrument voices are also 10 in number like we saw on the P45. They all sound authentic too. Like we mentioned, the P71 and the P45 are cut from the exact same block. There’s no real difference between both of them except that Yamaha made the P71 available to just one store. Simple, intuitive control panel and interface. Sustain pedal could be better. We know what you’re thinking, “another Yamaha?” Well, what can we say? The brand knows its business. This time we’re reviewing the Yamaha PSR-EW300. This is a fantastic value purchase where you get a keyboard, a stand and an adaptor for less than $300. We told you this was a fantastic value purchase, didn’t we? Of course at this unbelievable cost, you should expect some trade-offs here and there. It’s only normal and not such a huge deal. So, the very first trade-off you notice here is the fact that this comes with only 76 keys. This is 12 keys short of a regular, full-sized digital piano. So, will the missing 12 keys affect your performance? Well, we’re going to be straight up with you. It is. And, in fact, some tutors might not even take you up, especially since the keys are not weighted at all. However, the truth is that in the beginning, you might not need all 88 keys just immediately. So, 76 keys might tide you over for now. At least, it’s a lot better than 61 keys. That said, this is the first keyboard on review today to come with a lesson program. We really appreciate that since most of the keyboards we’ll be checking out today are targeted at beginners. A lesson program can help you jumpstart your piano education the moment you receive this. Another really impressive feature on this keyboard is its massive library. This piano is practically bursting with 165 styles and 500 built-in instrument voices. We can’t say that all the voices on here will blow your mind, but the grand piano tones are quite good. Finally, you can expand your keyboard’s functionality thanks to the USB connectivity option you get with this keyboard. Massive library containing 500 voices and 165 styles. Also comes with USB connectivity. Comes with only 76 keys. Just like Yamaha, Casio is a leader in the piano market. This brand has risen far above the stereotype people used to have about its products being toy products. And right now, Casio very favorably competes with fellow piano brands, case in point, its Casio Privia PX160BK. It’s compact and lightweight, so it’s not a very demanding keyboard. It can stay just about anywhere and moving this around won’t be so difficult either. It weighs just 25 pounds and that is despite being a full sized keyboard with weighted keys and excellent technology. You want to be careful though, this is all plastic and if you’re not careful, you could damage this from careless handling. In fact, if you can spare the extra change, get a gig bag. We love how the controls are few and easy on the eyes. However, because they are so few, even though they keep the interface clutter free, they can also be somewhat inconvenient. But you’ll pick up the shebang before you know it. The keyboard is where Casio kills it for us on the Privia PX-160. At this price point, you’re getting a keyboard that comes with 88 keys with Tri-Sensor Hammer Action II. So, the keys offer fantastic resistance and they are also sensitive enough to pick up every nuance of play. And let’s not forget the simulated ivory/ebony which is a rarity in beginner keyboards. Finally, sound is also one of a kind. There are 18 built-in tones which sound beautifully, especially the grand piano sounds. The Multi-Dimensional Morphing AiR Sound Source is a high quality sound engine too. And it reproduces sound without any distortion whatsoever. In all, great keyboard worth the buy! Keyboard is very realistic for a beginner piano with Tri-sensor Hammer Action II and the ivory/ebony keytops. Keys can get a little noisy. This 88-key digital piano beauty right here is called the Alesis Recital. It’s from the piano brand, Alesis which while not exactly one of the biggest names in the piano market, is still a great brand all the same. This brand has been of great help to beginning pianists worldwide with its quality entry-level pianos. The Alesis Recital is less expensive than most of the Yamaha and Casio we’ve reviewed so far. But even at its competitive price, it still offers some serious features we think you should check out. So, in case, you don’t have enough to patronize the Yamaha, Casio and the likes, this is an excellent compromise. The Alesis Recital comes with 88 semi-weighted keys. And by semi-weighted we mean that the keys do not offer the kind of resistance that the P45, for instance, might give you. However, they are not supposed to be springy either like you have on the NP11. Furthermore, we are always psyched by Alesis’ commitment to learning. This brand offers some of the most extensive learning programs we’ve seen on entry-level keyboards. Besides the learning function on the keyboard, the user also gets the opportunity to subscribe to Skoove Premium where they can learn even more. In fact, just by purchasing this keyboard, the user gets 3 months free sub automatically. Now, here’s where things get a little err… not so cool. There are only 5 built-in voices on this keyboard. But hey there’s Layering and Split which can help you improvise and make some other cool sounds from the 5 you have. You know what they say, if life gives you 5 tones, use Split and Layering to make more for yourself! This piano gives a well balanced, and natural sound. Lesson mode is well thought out and very extensive so much so that even a complete novice can follow. The organ voice sounds amazing. Operates on batteries which improves portability. Very few bells and whistles. Keyboard comes with poor action and is more springy than semi-weighted. Speakers aren’t the best out there. In one word, we will describe the Yamaha NP11 as portable. It’s a portable little machine with a high usability that makes the keyboard really attractive to beginners. A younger sibling to the NP31, this comes with nearly all the nice features that its big brother came with. However, this time it comes in a more compact package. Now, don’t forget to keep your expectations realistic. This isn’t a full sized digital piano and if in anyway, you feel the NP11 is a disappointment, it’s because you’re expecting all wrong. In fact, if we were to give a recommendation, we’d say this is a god keyboard to start the kids on. Unlike most kid keyboards you find, the NP11 isn’t a toy. It’s well made with a solid build and features that are kid friendly. Of course, the features here are not staggering in number but they are good enough for the purpose. Keys are 61 in number here which we agree is not exactly ideal. But this will work for kids anyway (except you’re thinking of getting a piano tutor for your kid). There’s no hammer action here and we didn’t expect that. This comes with springs instead which might be good enough for kids who haven’t built the required finger strength yet. Now this keyboard comes battery-operated. So, get ready, your kids are going to bring this on nearly every road trip you guys get on. This does not come with a power adapter though, so you’re going to have to get that separately. Finally, we love how pleasant and delightful this keyboard sounds. It’s obvious the amount of work Yamaha put into the NP11 to make it sound so good. Compact enough to stay just about anywhere, dorm, small room, apartment, wherever. Great introduction to piano for kids. This is would be insufficient for anybody who’s had even a day’s worth of experience with a piano. Even for kids, we’re not sure many piano tutors would be willing to take your kids with this piano. The Williams Allegro 2 Plus is the upgrade to the Williams Allegro 2. There isn’t so much of a difference between both keyboards, though. Williams only tried to improve on the sounds. And the power adapter which we didn’t get on the Williams Allegro 2, we now have on the 2 Plus. That said, it’s time to check out the features on this keyboard. Now add that to the fact that this is lightweight and compact, and you get a portable keyboard that’s moveable just about anywhere. Just like the Allegro 2, the Allegro 2 Plus also comes with 10 built-in instrument voices. And like we said, Williams made some improvements on the sounds. So they sound a bit better than on the Allegro 2. Of course, there’s also the Split and Layer functions which can help you make more fantastic sounds. Finally, the Allegro 2 Plus comes with a decent keyboard. 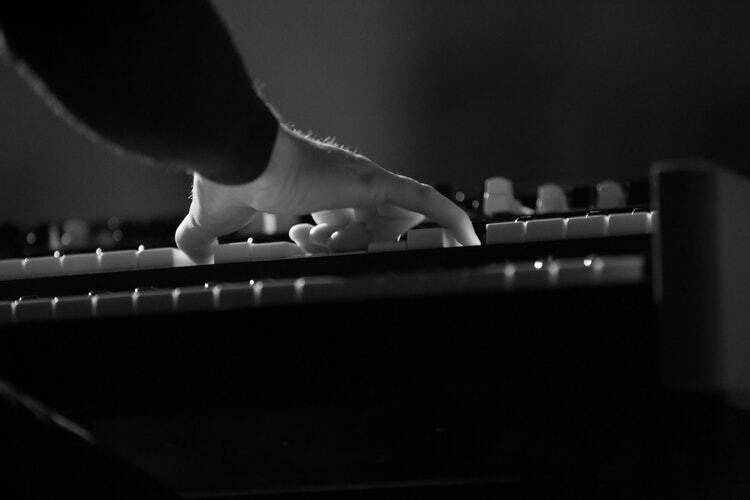 There are 88 keys which Williams describes as fully weighted. However, we can’t say this comes with a real hammer action. However, we can’t complain too much at this price point. Comes with a solid build. Tones are better sounding than on the predecessor – the Allegro 2. 88 full-weighted, sensitive keys that’s sufficient for the beginner. Comes with an LCD display. You can only use a damper pedal on this, no sostenuto or soft pedal. The Artesia PA-88W is another wonderful sub-$500 keyboard on review today. It’s not from a popular brand. And, in fact, you probably haven’t even ever heard of the brand before. But the brand is somewhat popular, maybe not as much as Williams which we just looked at. But it sure has received some patronage. Anyway, we think this is another fantastic value purchase because at a sub-$300 price tag, you get a keyboard as well as a carrying case. Now, if you’ve been following our reviews, you’d recall that we did mention to be careful with portable keyboards. In order to make these pianos portable, manufacturers often swap heavy duty materials for lighter plastic. So, while the keyboard will actually come in lightweight, they will also be quite fragile. Thankfully, this bundle comes with a carrying case which should keep your keyboard safe as you move around with it. On to the keyboard, there are 88 keys here and they are fully weighted. However, they also come with a spring action. So, this means that there is no hammer action here. For a digital piano, this might be a downer since the idea should be to try and mimic an acoustic as much as possible. Nevertheless, there are still benefits that you stand to gain on the Artesia PA-88W. It is compatible with all kinds of learning software, music apps and DAWs. Finally, the 12 built-in sounds here are awesome especially the Grand Piano tone that’s quite deep and expressive. And then there’s also the Split and Layer function which can help you play with them to get even more sounds. Comes with a carrying case included in the package. Compact, lightweight, and super portable. Compatible with learning software, music apps, and DAWs. Deep and expressive Grand Piano tones. Keys come with spring action. Keys are not quite realistic. Have you found something for yourself so far? If you haven’t, then don’t give up just yet, the RockJam 61-Key Electronic Keyboard SuperKit might just be the one for you. 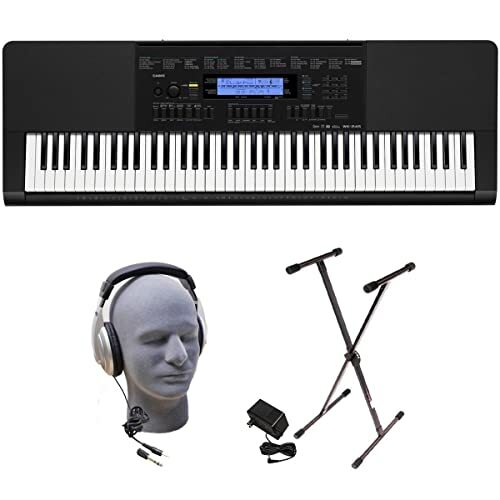 If you need to make some great music, then you absolutely need an electronic keyboard. 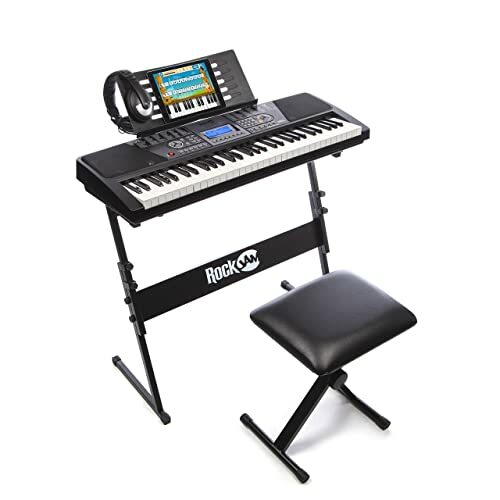 And, especially if it’s your first time out, a good choice is the RockJam 61-Key Electronic Keyboard. It’s not as expensive as other synths from high end brands and yet it still packs some great features. We love the controls here. They are fully integrated, easy to use, highly customizable and offer the user a wide range of options when it comes to making music. Plus, there’s also an LCD display which means that you’ll be able to interact even better with your keyboard. And for those who are just starting out, this also comes with instructions to help you find your way around. Plus, there are also demo songs as well which can help you practice on your own. As for sounds, it’s a huge fest here. There are about 100 sounds here as well as 100 rhythms too. It gives you a whole lot to be inspired by as you start out on your keyboard. So, by simply pressing a button, you can create different kinds of songs as much as your imagination permits. A huge library of sounds and rhythms. This does not offer USB connectivity. Can only work with an iPad. And here’s where we draw the curtains to a close – the Casio WK245 PPK. This is perhaps our best value purchase here. It’s literally unbelievable because for a sub-$250 price tag, you’re getting a keyboard, a stand, an adapter, and some headphones. We got that right, yeah? The Casio WK245 is the replacement to the WK225 which is currently phasing out in the market. It’s definitely an upgrade from the WK225. However, it’s still very much a beginner keyboard. The WK245 PPK is fantastic for learning, making music, and recording music. Plus, it is quite lightweight which makes it really portable enough to be carried around with you without stress. 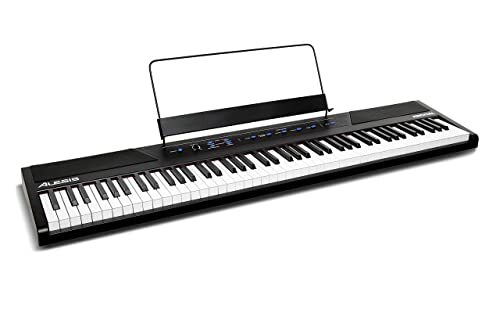 Now this is an arranger keyboard and coming with 76 keys, it means you get to do more when compared to a 61-key keyboard. The keys are not weighted, by the way. So, if it matters to you that your keyboard comes with weighted keys, then move along, sweetheart. Anyway, other features we like about this keyboard include the fact that it comes with really powerful speakers. Plus, the built-in learning system here is one of a kind. And let’s not forget all the other advanced functions here like the scale changer and auto-harmonizer. It’s quite affordable especially with all that you get in the package. This keyboard comes with 76 keys which means you can do more. The keys here are not weighted. While it would be nice to have an acoustic piano, acoustic pianos are expensive and high maintenance. Thankfully, there are digital pianos these days which are doing a fine job of standing in for classical pianos. They cost a lot less and they offer a much higher level of convenience too. You can now learn the piano right on your own living room! Now when going for a digital piano, especially an entry-level piano, you’ve got to understand where to draw the line. Yes, you want a keyboard that’s high quality and comes with a good number of features. But you don’t want too many features that are way beyond the beginner’s current knowledge level. For the beginner, here are a couple of factors you should consider when getting an entry-level keyboard. 88 keys are best for the beginner because it means that they will be able to transit to a classical piano much more seamlessly. But then again, with fewer keys, the learning curve could be a bit less steep and players might actually learn faster. Plus, less keys means your keyboard will be more portable than an 88 key keyboard. So, 61 and 76 keys are popular entry-level keyboard options and they will suffice for the initial lessons the beginner will encounter. However, when you encounter more complex lessons, only 88 keys will be able to deliver. So yeah if you get a 76 or 61-key keyboard, you’ll sooner or later still have to make the upgrade. Oftentimes, beginners have to travel a lot with their keyboards especially if they can’t afford a home tutor. In that case, you’re going to have to get something that’s lightweight enough to be portable. The average weight of such keyboards is about 25 pounds. Also, remember to check out the power requirement. If it can also operate on batteries, then your options for portability also increase. 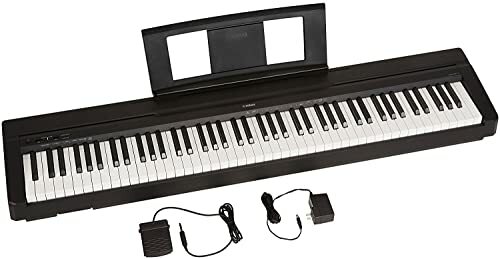 Especially if you plan to play on an acoustic piano at some point in your life, then you need to get a keyboard with weighted keys. Weighted keys will give you the opportunity to build the correct piano technique you’ll need to make the smooth transition to an acoustic piano later in life. And this is because piano makers use little hammers in their pianos in order to make them fully weighted. So, the keys offer the resistance and tension that an acoustic piano gives especially when the action of the digital piano is graded. It’s time to reveal our winner in today’s reviews. And clearly, that’s the Casio PX-160. Its keys feel like bliss, the sound is amazing, and there’s a lesson function as well to help the beginner start out on the keyboard. We think Casio did a good job delivering on some of the most important qualities we want to see on entry-level keyboards. In fact, by throwing in the simulated ivory/ebony keytops, Casio literally outdid itself. So, as you can see, here’s our choice. What’s yours?